We were scavenger hunting in Asheville, NC. It was a Groupon, smartphone, "see the city" game. Family bonding. Discover Asheville. All that. The fun part about this particular activity was the city discovery aspect (the general consensus was the rest of it was a little boring). Did you know Asheville has it's very own Wall Street? 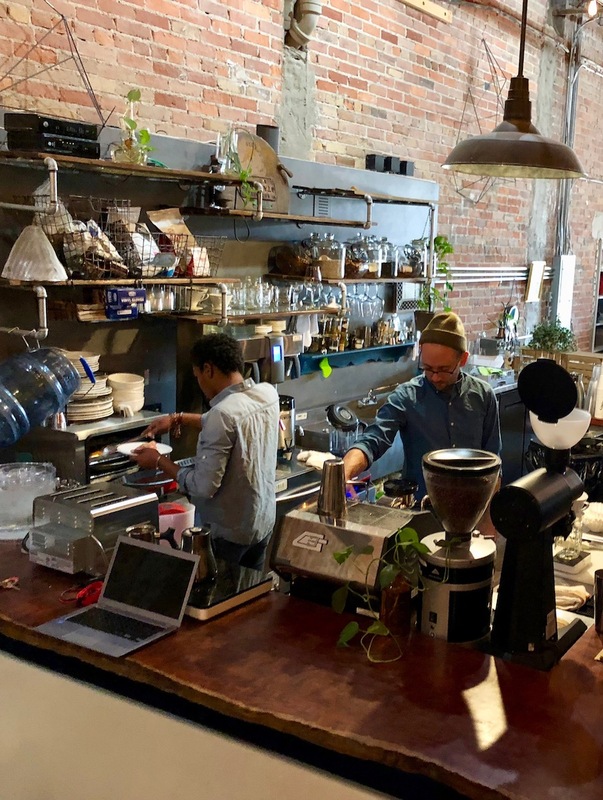 Did you know, located on Asheville's Wall Street, there's a quaint respite for coffee and snacks called "Trade and Lore"? After wondering around Asheville, we were ready for coffee. And with a name which includes the word "lore" - I'm in. For being a bit off the proverbial beaten path, Trade and Lore Asheville was a busy place. That said, there was plenty of seating. If the weather had been ever-so-slightly warmer, there would have been plenty of seating outside. We found a table to accommodate the entire fam. Trade and Lore also accommodated our eclectic variety of drinks, as well. The baristas were friendly and knowledgable. The product was perfect for our Ashevillian rest stop. I don't know this - but, I'm suspicious the menu frequently changes. The drink selection was interesting to the point of being experimental. But, if so, the experiments were a raging success. The son and I had our typical fair, an iced mocha and a single origin pour-over, respectively. I know the coffee I drank that day was from Ethiopia, with trademark floral and citrus. It was both subtle and bright. Most importantly, it satisfied. Here's where things got interesting. Reneé ordered an iced fruit tea soda. It was a party in the mouth. Flavorful, crisp, and refreshing. Possibly, the most interesting tea I've tasted. The daughters went with flavored lattes, which also had an unusual flavor combinaitons (I can't remember what it was). Again, interesting and experimental, subtly sweet, and delicious. I had to go back to order another cranberry muffin, as well. Reneé had to share her first one. It was a hit. An eclectic lore-based gift shop sits at the back of Trade and Lore; selling unique and quirky, fitting well in the Asheville context. There is another Trade and Lore located in the NoDa neighborhood in Charlotte, NC. Will be checking them out, as well, next time I'm over there. When you go to Asheville, there are a lot of great coffee shops to choose from. But, I do recommend tracking down Trade and Lore.